Dental hygiene is the building block of good dental health. Regular teeth cleaning, both at home and in the dentist’s chair, is vital to maintaining healthy teeth and gums. At Station Square Dental, our experienced oral hygienist, Kat Rigg is highly trained in teeth cleaning, as well as monitoring your mouth for any signs of concern. 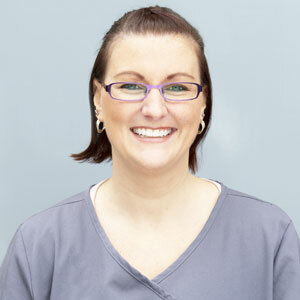 She is also on-hand to offer expert advice to you and your family regarding optimal oral health and hygiene. Your appointment with our oral hygienist will begin with her thoroughly assessing your mouth, including teeth, gums, and other soft tissues. She will also obtain any digital imagery required, such as high-resolution photos and X-rays to gain a more comprehensive overview of your oral health (including the spaces that are hard to see). From here, our hygienist can determine what is needed to get your oral health and hygiene to an excellent state. She also applies a plaque disclosing solution, before taking a photo of the results and showing you where the majority of your plaque lies. This is a great way of demonstrating the more problematic areas within your mouth that need extra attention when brushing and flossing. Finally, our hygienist will perform a thorough clean, including both an ultrasonic and hand scale, as well as a full mouth floss, fluoride treatment, and the application of desensitising agents to sensitive teeth. Additionally, she uses a sodium bicarbonate mixture to target more stubborn, hard-to-remove stains, leaving you with a smile that doesn’t just feel healthier, but looks stunning too. The general advice is every six months, but different people need different care, so this can vary. When you come for your check-up, you’ll get a personalised recommendation for how often you should see our hygienist. Want to book a thorough teeth clean with our experienced oral hygienist? Please call (03) 9568 8911 today to schedule your appointment at our clinic.